The Neuse River Offers a wide variety of outdoor activities including sailing, water skiing, and fishing. The River House has its own private dock& grass access to the Neuse River and we offer the use of the home's kayaks and canoe and life vests for those guests who might want to tour New Bern and the surrounding area by water. Nine foot long by four feet deep pool. Can be heat in cooler seasons for an extra cost. . For those guests who would prefer to just sit back and relax, enjoy the six person hot tub. 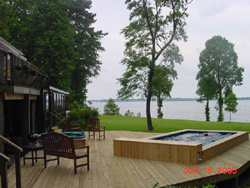 The swimming pool can be heated to become a larger warm alternative to the hot tub in cooler seasons. Heating the pool requires several days advanced notice and an additional fuel charge. Bikes can be rented at several area Bike shops, including Atomic Cycles at 504 Front Street and Flythe's Bike Shop at 2411 Trent Road. Also in and around New Bern are the Trent River, salt marshes, The Croatan National Forest, the Inter-Coastal Waterway, the Bogue Sound, the Bogue Banks, and Oriental, NC. The waters of North Carolina’s ocean beaches are approximately thirty-two miles from the Fort Point River House. A lovely nearby sandy river beach is Flanner’s Beach on the Neuse River. It is part of the Croatan National Park. There are several several services that offer scenic cruises on the Neuse or Trent Rivers. New Bern, nearby Havelock, and Craven County provide a variety of year round festivals, musical and theater events and art shows in addition to the historic building and tours. More Information on Local attractions.